We’ve all been there: someone next to you decides it’s time to eat that smelly sandwich or microwaved meat dish. Worse yet, that someone was too busy preparing lunch earlier in the morning to put on deodorant. Welcome to smell hell, where each visit is no less unpleasant than the last. To stay away from, or get yourself out of, this putrid place, follow these tips. 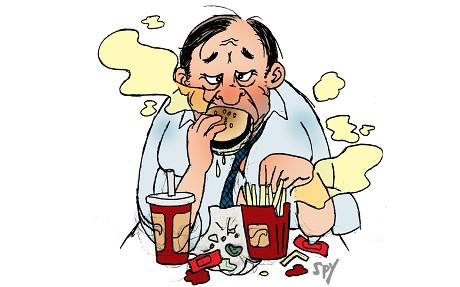 Don’t be rude with smelly food: Whether at work or school, your desk is not a dinner table. While your taste buds like your lunch, the noses around you may not. In fact, recent surveys have found smelly food to be a top annoyance for both office workers and airplane travelers. Last September, in response to its own studies, the city of Vienna decided to ban smelly food on public transit.If you must eat in class/at your desk, avoid bringing any hot food, smelly or not (if it smells good it could make others hungry!). When in the lunch room, do not microwave pungent foods like onions, popcorn, garlic, fish, eggs, or cabbage. When someone else brings fetid food: If someone else’s food is bothering you, politely ask them what’s in it. Once they tell you, say something like “that looks very tasty, unfortunately I’m allergic/sensitive to [insert ingredient].” This will make them more aware of what they eat around others and may even get them to move away or stop eating. When someone else smells bad: The main rule for pointing things out to people is that if they can fix it right away (fly unzipped, food stuck to chin) then one should say something.In the case of body odor or bad breath, you will need to have a solution at hand if you want to politely bring up the subject. Offer the other person a mint or a sample of your “favorite” new perfume. Should you not have mints or perfume samples with you, casually mention a new breath freshener or deodorant you’ve started using. The person should get the message.